I fell for one of the classic marketing ploys today. Free stuff. More precisely, the ol’ “bread at the back of the store” technique. An old friend was running the show at Destination Venus today – Harrogate’s graphic novel and comic store – and he stuck a note of facebook saying it was free comic day. My Yorkshire sensibilities kicked in. I scooped the nearest offspring (Sophie) and headed into town. Destination Venus (which I first wrote about here) is how a comic shop should be. Loads of comics at a range of budgets, staffed by (or at least today) by a fella who’s got a genuine passion in that world and a lot of knowledge. Today, around 10 to 15 titles were available to take away for nowt. Zero mulah. Null pence. Some good stuff as well – a wide spread of stuff for all ages – The promotion seemed to be called “Halloween ComicFest” and in the back of one of the titles there’s an advert for another FREE COMIC BOOK DAY – May 3rd, Next year – the day before StarWars day. Geek approved. As well as getting a bag full of free stuff, I bought a couple of brilliant looking titles. 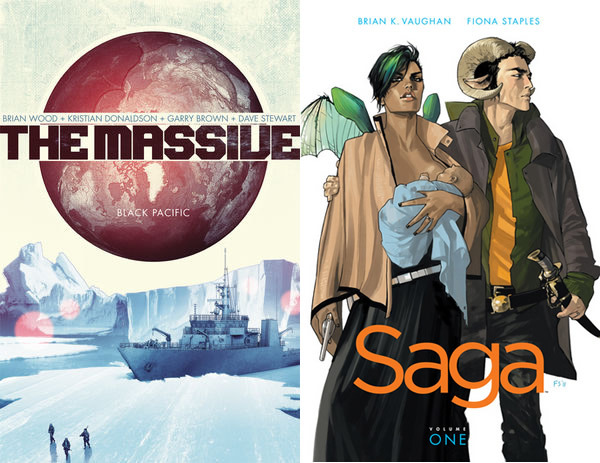 The one that I haven’t started – possibly due to ‘save the best till last’ is SAGA by the fabulous Brian K. Vaughan – writer of a title I loved called “Y The Last Man”. I’d mentioned to Ian on facebook that I’d liked ‘Y’ and he steered me towards SAGA. I also mentioned that I liked the idea of a post apocalypse dystopia type stuff (inspired? deranged?) and he steered me towards a book from Dark Horse called THE MASSIVE : Black Pacific. So far, this is brilliant. I’m loving the way the artists has colour washed parts of it to signify near history, far history or the here and now. Gritty stuff – strong characters, almost infographical overlays of information in places. Top stuff. We had a good natter about a bunch of other titles.. Possibly for future reference. I’ve been out of graphic novels for a few years.. probably since I’ve had my kindle, but as this broke (again) recently I decided to perhaps look at other formats of reading for a while. I’ve been getting stuck right in to my National Geographics, and reading a bunch of stuff from longreads (in between more recently, watching far too much Breaking Bad) – but a story.. a good yarn was what I was after. Ian from DV timed it nicely with the free comic offer this morning! Good stuff.